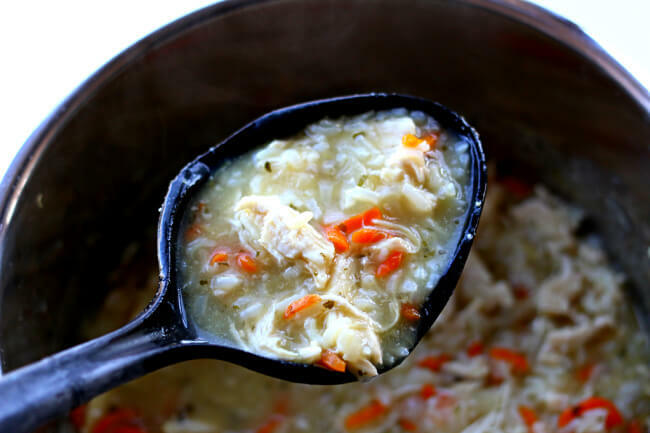 Slow Cooker Lemon Orzo Soup–A delicious soup with bites of chicken, orzo pasta and a bright lemon flavor. Really easy to make and amazing to eat! (This has been updated. 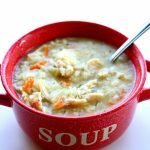 The original post was published April 2013) This could be a new favorite soup for me! I am totally in love with lemon and this soup delivers. The lemon zest and lemon juice pack a powerful punch but it’s not overkill. This soup satisfies without all the cream, fat or flour of other soups. My whole family gulped this soup down and agreed that is was a winner. I have made this soup both with orzo and with rice. The orzo was cooked on the stove and the rice was added straight into the crockpot from the beginning. If you want more a creamy tasting soup then use the rice. It soaks up a lot of the liquid and gets almost creamy, like a risotto. If you want a more brothy soup then use the orzo. 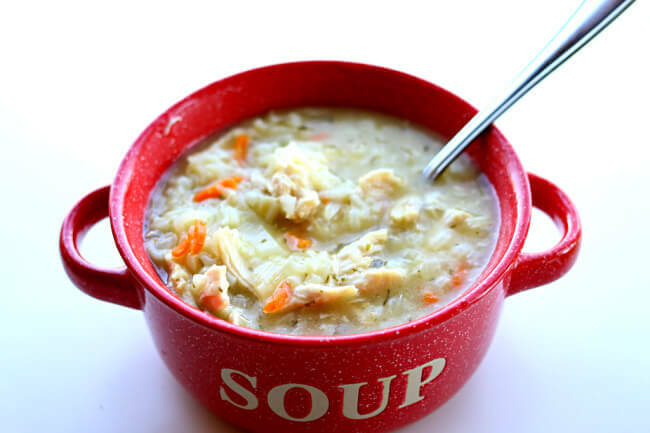 To make Slow Cooker Lemon Orzo Soup I used my 6 quart oval Kitchenaid slow cooker. * I love this slow cooker. It cooks low and evenly. I love the medium heat choice because most slow cookers that I’ve seen only have the option of cooking on low or high. If you’re going to buy just one slow cooker, this is the one that I recommend. 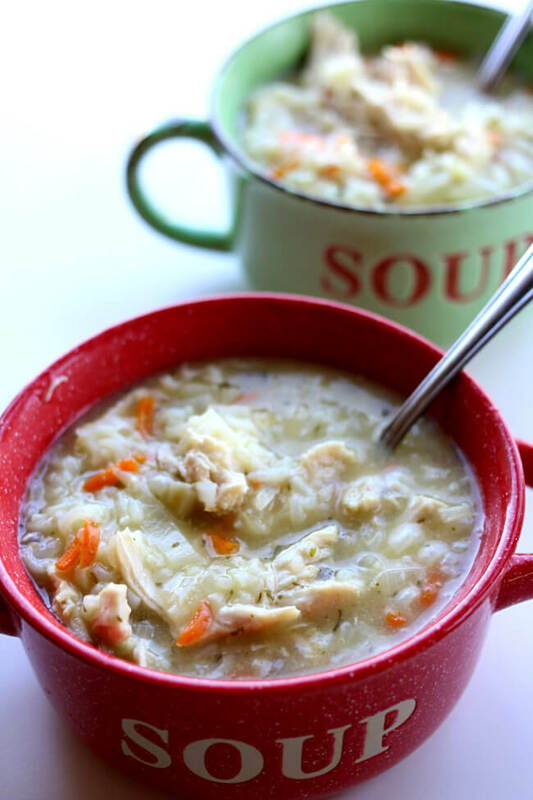 A delicious soup with bites of chicken, orzo pasta and a bright lemon flavor. Add chicken, broth, bay leaf, carrots, onion, celery, garlic, thyme, parsley, lemon rind, lemon juice and salt to the slow cooker. Cover and cook on LOW for about 4-6 hours. Cook orzo according to package directions on the stovetop until tender (if added straight to the crock, it will soak up a lot of liquid and make it a little weird). Remove the chicken thighs and shred. Then return chicken back into slow cooker. Add cooked and drained orzo into the slow cooker. Ladle into serving bowls and then top each bowl with about 2 Tbsp Parmesan cheese. You can also use jasmine rice in the place of the orzo. Add the uncooked rice to the slow cooker at the beginning of the cooking time. When the rice is tender and the chicken is cooked through you can serve. The rice will soak up a lot of broth so it will be more of a creamy, risotto like consistency than a soup. Get the Instant Pot version. 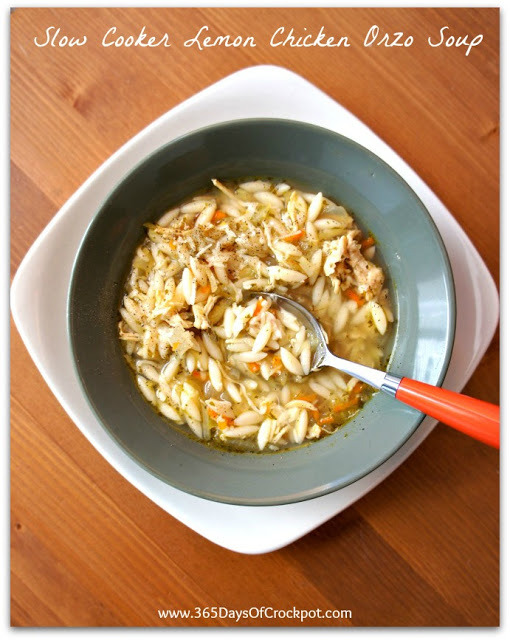 Like this recipe for Slow Cooker Lemon Orzo Soup? Get all my new recipes delivered to your email inbox by signing up below. Can you use your slowcooker function on your instant pot? Yes but I’d adjust it to the higher setting. I’ve heard the lowest setting is like keep warm instead of an actual cooking setting. Just made this to night with low sodium chicken broth, excellent. Awesome!! Thanks for your comment. Can't wait to make it! How much would you say a serving is? Looks delicious, but would chicken breasts work instead? I'm not a fan of dark meat. Yes Robin it will work! They don't take as long to cook as dark meat though. Good luck! Enjoy! Yes, I would use brown rice though! Anon, I just updated the recipe! sorry about that! Where does the olive oil come into the recipe? Thank you. Oh and did you notice the dish, bowl and spoon? They came from your kitchen!! Kalyn, that's too funny! We must be on the same wave length! Okay, this is a little bit eerie, but I just made a soup almost exactly like this yesterday. Orzo. Chicken. Lemon. We may be channeling each other.